Known in Michigan from a “salt lick” near Hubbardston, Ionia Co. and brackish banks of the Maple River in Clinton Co.; recently collected only near the Maple River. A species of both Atlantic and Pacific coasts, extremely local inland in North America. A small, delicate plant. The scales are acute to obtuse or rounded, greenish to straw-colored (sometimes with a little brownish on the sides), the lowermost sterile. MICHIGAN FLORA ONLINE. A. A. Reznicek, E. G. Voss, & B. S. Walters. February 2011. University of Michigan. Web. 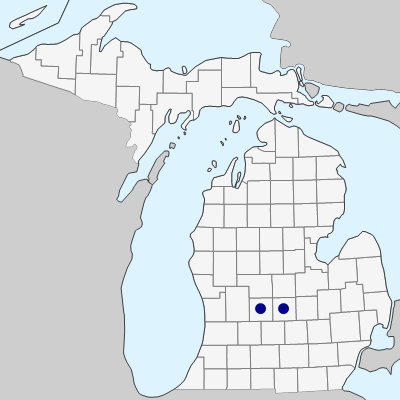 April 22, 2019. https://michiganflora.net/species.aspx?id=1116.